In many Pagan traditions, participants opt to have a handfasting ceremony rather than a formal wedding. Handfasting was common centuries ago in the British Isles, and then vanished for a while. Now, however, it's seeing a rising popularity among Wiccan and Pagan couples who are interested in tying the knot. In some cases, it may be simply ceremonial -- a couple declaring their love for one another without the benefit of a state license. For other couples, it can be tied in with a state marriage certification issued by a legally authorized party. Either way, it's becoming more and more popular, as Pagan and Wiccan couples are seeing that there is indeed an alternative for non-Christians who want more than just a courthouse wedding. A common question among Pagans is that of who can actually perform the handfasting ceremony itself? 2. What are your state’s requirements when it comes to your answer to Question 1? The reason this is so complicated is as follows. If your answer to Question 1 is that you simply wish to have a ceremony celebrating your love for your partner, and you don’t want to bother with all the red tape and hassle that comes with a legal marriage, then it’s fairly straightforward. You’re just having a non-legal ceremony, and it can be performed by anyone you like. A high priest or priestess, or even a friend who’s a respected member of the Pagan community can do it for you, with little to no fuss. However, if your answer to Question 1 above is that you’d like to have a meaningful ceremony celebrating your love that is ALSO sanctioned and legally recognized by the state in which you reside, things get a little more complicated. In this case, whether you call it a handfasting or not, you’ve got to have a marriage license, and that means that the person who performs your ceremony needs to be someone who is legally allowed to sign off on your marriage certificate. In most states, the official rules state that any ordained clergyperson may solemnize a marriage. 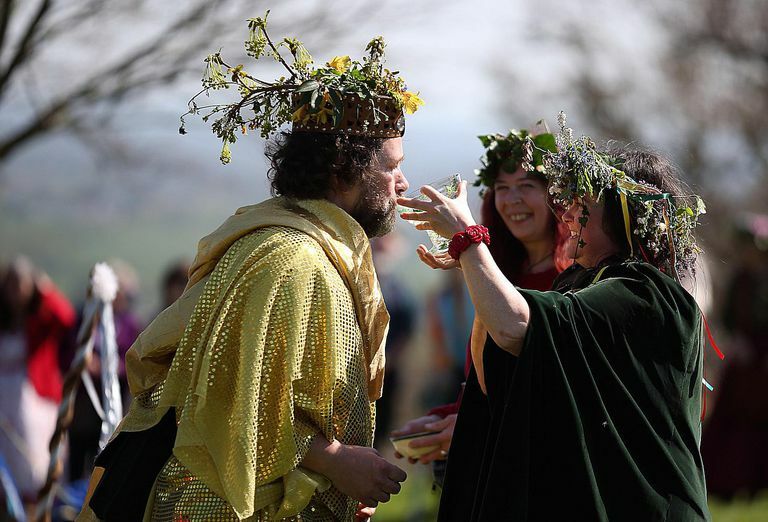 However, the problem that the Pagan community runs into is that many times, these rules apply to Judeo-Christian faiths that have a specific course of study for ordination, or a hierarchy within the faith. A Catholic priest, for instance, is ordained and on record with his diocese, and is recognized as clergy by all. On the other hand, a Pagan high priestess, who has been studying on her own for ten years and with a small local coven for another five, may have difficulty getting the state to recognize her as clergy. Some states allow anyone to apply for a minister’s license, as long as they can provide documentation from someone within their religious group stating that they have studied and been recognized as a member of the clergy. Often, once a minister’s license has been obtained, the individual may begin solemnizing legal marriages. Be sure to check with whatever governing body oversees such things in your state, before you begin looking for someone to perform your ceremony - and anyone who's willing to perform it should be able to provide you with their official credentials. It is important to note that there are some states that do not recognize minister’s licenses obtained via online churches. The bottom line? Once you’ve decided on the nature of your handfasting - whether it’s going to be simply ceremonial or totally legally recognized as a marriage - check with your state to find out what the requirements are as to who may solemnize the marriage. Then, once you’ve found out these requirements, check with any potential clergy carefully to make sure they are legally able to officiate your ceremony. Don’t be afraid to ask for licensing or references. Ready for a Handfasting? Here's What You Need to Know!